This tutorial is designed for a decision maker to get the basics of how you can determine if a sound affects a marine animal. The user can proceed from one topic to the next in sequence or jump to a topics of special interest. The DOSITS pages contain additional content that may be of particular interest in the Animals and Sound Section as well as the Science of Sound Section. There is also a companion tutorial for decision makers on the potential effects of sound on marine animals. There are many factors that influence if and how much a sound source affects marine animals. How loud the source is, what frequencies it transmits, where it will be used, and what species might be in the area are all factors that need to be considered. This process is called ecological risk assessment. The steps of this scientific process are illustrated in the following diagram. The first step is to define the problem. This involves determining what might cause ecological effects. The next stage involves two steps, estimating the probability of being exposed to the problem and, based on that exposure, determining the types of ecological effects that are expected. Based on these results, the risk can be estimated. What are the sound levels to which the animals are likely to be exposed? 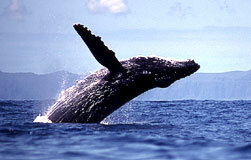 Humpback whales are commonly sighted in nearshore waters near Kauai, Hawaii during the winter months. Photo courtesy of Ann Zoidis. Scientists use data on the way in which the animals respond to similar sounds and sound levels to estimate how much the sound might affect their behavior. The following sections walk through the steps for determining if a sound affects a marine animal based on findings reported in peer-reviewed scientific literature. DOSITS has a list of suggested references for animals and sound. All the tutorial pages have complete reference lists for each page.